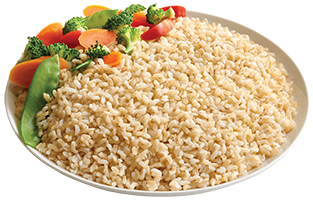 Success® Basmati Rice is an aromatic, long-grain rice that is grown in the foothills of the Himalayas. It is known as the prince of rice because of its fragrance and subtle nutty flavor. The grains of basmati rice are long and slender and when cooked, the grains stay separate and fluffy. This premium rice is the perfect accompaniment for Asian, Middle Eastern and traditional dishes. Pour about 1-quart water into medium saucepan and submerge 1 bag of rice. Bring water to a boil and boil uncovered 8 to 10 minutes. Remove bag IMMEDIATELY with fork and drain. 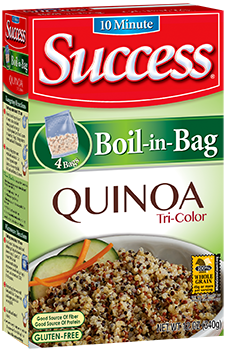 Tear bag at notch and empty rice into serving dish. Add butter and salt, if desired. 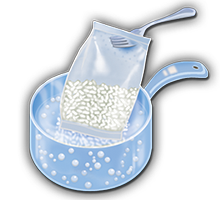 To prepare multiple bags: Pour 3-quarts water into large saucepan and submerge 2 to 4 bags of rice then follow Steps 2 and 3. 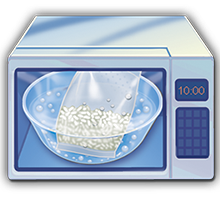 In a 2-quart microwave-safe bowl, submerge 1 bag of rice in 3 cups of water. Microwave on HIGH 15 minutes. 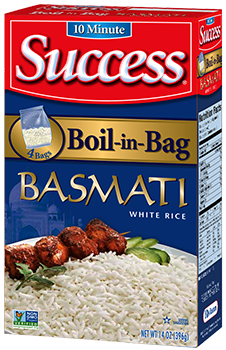 To prepare Success® Basmati Rice "out-of-the-bag", click here for more information.